Have you ever go on a trip and when you came to the viewpoint, you dont not know names of the hills, mountains, towns and villages that lies in front of you? You can try to identify them, if you have a map and a compass, or you can try our application. By click to the Panorama tab you will get to the panoramic generator. It will draw outlook based on your location and orientation, same as you see it. Just turn on your device positioning (GPS) and allow the sharing of positions in the web browser. Or you can enter your location manually by moving the marker on the map. This is useful, for example, if you want to prepare a view even before they go to that location. 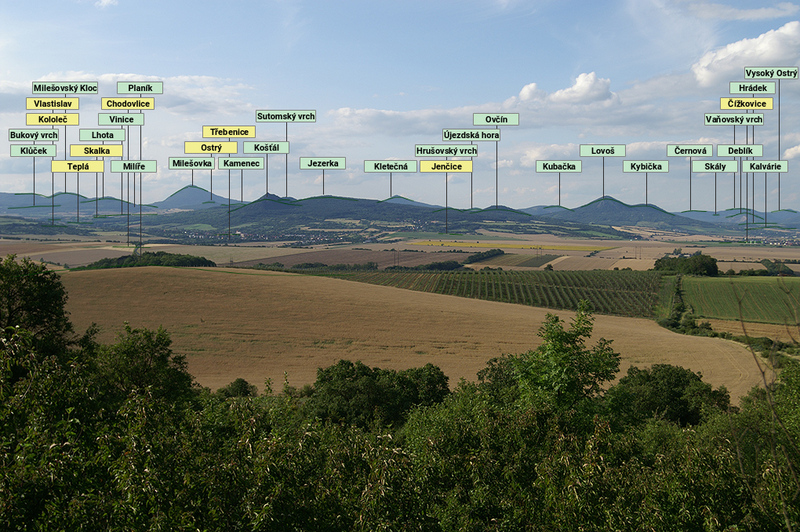 The following two pictures shows generated view for hills in "České středohoří" region in Czech Republic and its comparison with the view from Google Street view. Clicking on the pictures you can launch a preset generator or go to Google Street view. The view generator works for any place on Earth thanks to the Open Street Maps database. This database have not much data for some places on Earth. Because of that data can be added into internal database. Currently, the internal database contains detailed data for some areas of the Czech Republic and Slovakia.